Empowered means to invest with authority, to authorize. In recent usage, empowered has come to mean control of your own destiny. Who does not want to be in control? I know I do, but living with Lupus and Fibromyalgia it can sometimes we can’t control anything. It can make me want to scream, especially hospital settings. Everyone hopes that somehow we hold the reins to our future and that strangers or fate does not pull all the strings. The Empowered Patient is a book that gives the power and the reins of your illness back to you, the patient. Written by CNN Senior Medical Correspondent, Elizabeth Cohen, this book is a no nonsense approach based on her own experiences as a patient and a caregiver. Ms. Cohen remarked that “the days of Dr. Marcus Welby are gone.” Today any patient will confirm that you need to be your own best advocate. The book is very easy to read and navigate, it does not feel “textbooky”. So many health books are written by doctors or scientists and not real people in real situations. This user friendly book covers such topics as: How to be a Bad Patient, How to Find Dr. Right (and Fire Dr. Wrong), Don’t Leave a Doctor’s Appointment saying “Huh?” and Don’t Let a Hospital Kill You. As I skimmed through the chapters titles I actually giggled to myself at how true the scenerios/ topics were. Unfortunately, I have had a lot of practice being a patient- too much practice, that at this point I should get a university degree as an Expert Patient. If I taught a class in being a patient and advocating for yourself this would be the textbook. But no matter how much “practice” you have, we are all still human and continue to make mistakes. I call a good game, but I slip up, get lazy and forget my own advice at times and a book like this is just the right reminder we all need to put ourselves first. In fact there are times when I refer back to it for ideas and tips. If you are on or about to enter the rollorcoaster ride of healthcare, buckle up and buy this book! 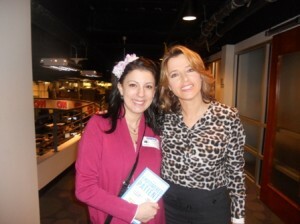 *editorial note: I have been interviewed by Elizabeth Cohen for her book and for column on CNN.com. I am honored to even be included in the book on page 28 and page 50. I am also listed as a reference in the back of the book. While I was in Georgia for an advocacy project I had the pleasure of meeting Elizabeth. When I spoke to her over the phone or over email in the past, I would never have imagined meeting her in real life. She was warm and friendly. 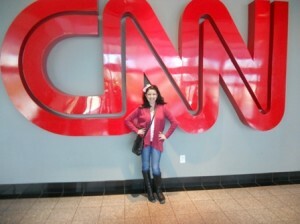 She took time out of her day to give us a little tour of CNN and the studio. I had my mother and my daughter with me and she was even awesome with my (at the time) 3 year old. It felt more like I was meeting an old friend, then a television celebrity. She spoke so passionatly about her job, she really cares about patients. At the time that I met her the movie “The King’s Speech” was in theaters. I did not plan on seeing it and after having a conversation with her about the movie, stuttering and a piece she was working on. Well, as you can guess she inspired me to see the movie as soon as I got back home from my trip. Watch out CNN, you just might have a new health blogger! Great review, I’d love to review this book too.